I would like to label the points of my point layer with the name attributes of the surrounding line features. The result should be a list, with the names of all lines next to the point (f.e. 10 map units). In the screenshot you can see, which result I do expect. in the label expression for your point feature. Note however it comes in order of the line featureid and not the value of "line_name_field". Not the answer you're looking for? Browse other questions tagged labeling qgis-3 or ask your own question. Displaying single label for multiple features with same value in ArcMap? Label specific lines in attribute table with syntax- ArcGIS? 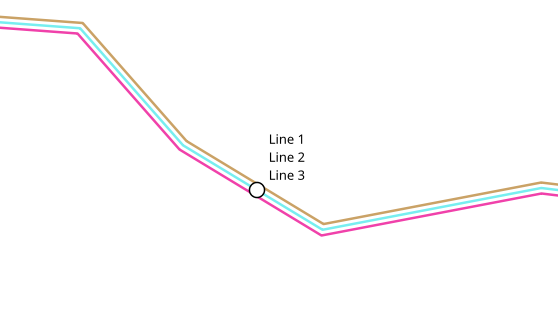 Create line label with automatic (justified) letter spacing in QGIS?